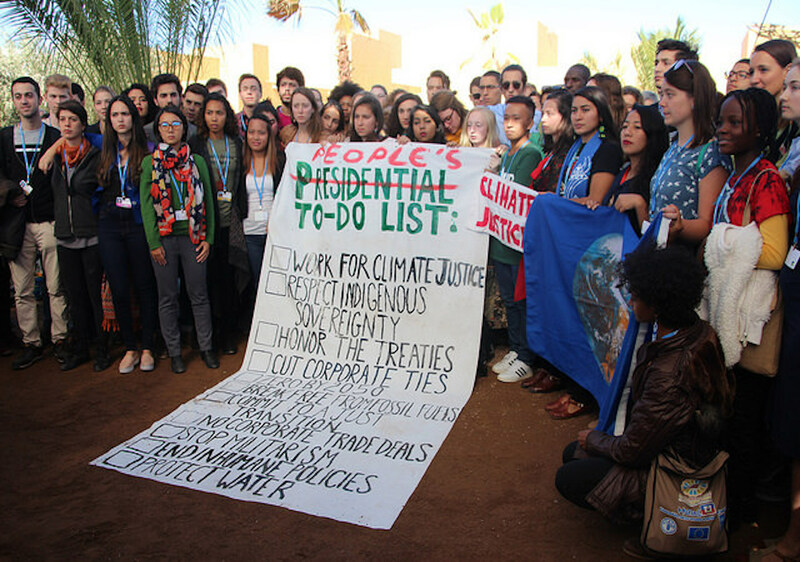 The following collective statement was issued by organisations, networks, and movements gathered in Marrakech at COP22, in response to Donald Trump becoming President-Elect of the United States of America and its potentially devastating implications for the cause of climate justice. Record breaking global temperatures are already threatening staple crops in many regions, bleaching the world’s coral reefs, decimating ecosystems, and driving killer droughts and floods that have devastated the lives and livelihoods of millions of people around the world, fanning the flames of every existing inequality. All around the world, people are taking action to stop this climate crisis from worsening. We are protecting and defending the places we love—waterways, forests, mountain ranges, our homes and our communities—and building the world we want: a clean, safe and more equal world.The fossil fuel special interest groups looking to take advantage of this election cannot stop this irresistible transformation. Donald Trump is the face of the broken economic system that has caused climate change —the concentration of wealth, lobbyists and corporate interests. Big business will have a seat at the White House for the next four critical years, threatening the lives of people in the U.S. and around the world. We all have a responsibility to show President-elect Trump and right-wing populists everywhere that we as climate justice groups and movements stand in solidarity with all people threatened and impacted by his Presidency. Islamophobia, homophobia, racism, sexism, elitism, and climate denialism are an insult and threat to us all. We are determined not to allow our governments to normalise or accept such a destructive- agenda. They must act in the global public’s interests and protect all of our futures by opposing the planet and people-wrecking policies espoused by Donald Trump. Win back power for people over big business and ensure they are held accountable for their actions. We urge U.S. state, city, and local governments to act to confront the climate crisis and confront Donald Trump head-on. The views of one man neither change how the rest of the world sees the climate crisis, nor can they change the reality of what needs to happen to keep temperature rise to a minimum, below 1.5°C. The rest of the world will go on with climate action, thanks to our incredible pressure as global movements and communities at the frontline who are building power. We call on world leaders to fulfil their fair share of climate action, including delivering climate finance and transferring technology, and prove that they take the crisis seriously. Action is needed now, in the next 4 years—rich countries must ramp up their short-term 2020 targets in line with science and fairness, and support poorer countries to prosper cleanly. In the international negotiations countries should put an end to the toxic influence of the U.S. which pushes for weak and toothless emission reduction targets. The global community, including governments, must forcefully apply political, legal and economic pressure with real consequences on the U.S. to do its fair share of action. As global citizens we commit to build a climate movement, whose beating heart is justice, that can break out of its silo and create a broad based progressive movement alongside Black Lives Matter, Indigenous movements, women's movements, student movements, LGBTQI communities, migrants movements, labour movements, and local movements against corporate power and the fossil fuel industry that work together to address the inequalities and injustices that blight our world. We stand in solidarity with Indigenous land and water protectors in Standing Rock, and climate justice and environmental justice movements that have been rooted in communities across the U.S. as they resist President-Elect Trump’s attempt to back more fossil fuel expansion which will poison our environment, our air and our water. In our communities around the world we will mobilize against Trump everywhere he goes and hold our own governments to account for their fair share of climate action including blocking their plans for fossil fuel expansion. Now is a moment of great fear and uncertainty, but we cannot give in to despair. People power has resisted great threats and transformed the world before—we must stand together once again for a just and liveable world for all. After 24 years of negotiations we are hurtling towards a 3.5 degree world, which will be catastrophic for millions. By Nika Knight, Common Dreams.